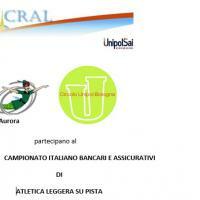 La sezione di Atletica propone ai soci la partecipazione a gare podistiche competitive e non competitive. strict warning: Non-static method view::load() should not be called statically in /home/cralunip/public_html/sites/all/modules/views/views.module on line 906.
strict warning: Declaration of views_handler_argument::init() should be compatible with views_handler::init(&$view, $options) in /home/cralunip/public_html/sites/all/modules/views/handlers/views_handler_argument.inc on line 744.
strict warning: Declaration of views_handler_filter::options_validate() should be compatible with views_handler::options_validate($form, &$form_state) in /home/cralunip/public_html/sites/all/modules/views/handlers/views_handler_filter.inc on line 607.
strict warning: Declaration of views_handler_filter::options_submit() should be compatible with views_handler::options_submit($form, &$form_state) in /home/cralunip/public_html/sites/all/modules/views/handlers/views_handler_filter.inc on line 607.
strict warning: Declaration of views_handler_filter_node_status::operator_form() should be compatible with views_handler_filter::operator_form(&$form, &$form_state) in /home/cralunip/public_html/sites/all/modules/views/modules/node/views_handler_filter_node_status.inc on line 13.
strict warning: Declaration of views_handler_field_comment_username::init() should be compatible with views_handler_field::init(&$view, $options) in /home/cralunip/public_html/sites/all/modules/views/modules/comment/views_handler_field_comment_username.inc on line 47.
strict warning: Declaration of views_handler_field_comment::init() should be compatible with views_handler_field::init(&$view, $options) in /home/cralunip/public_html/sites/all/modules/views/modules/comment/views_handler_field_comment.inc on line 49.
strict warning: Declaration of date_handler_field_multiple::pre_render() should be compatible with content_handler_field_multiple::pre_render($values) in /home/cralunip/public_html/sites/all/modules/date/date/date_handler_field_multiple.inc on line 185.
strict warning: Declaration of views_handler_field_node_new_comments::pre_render() should be compatible with views_handler_field::pre_render($values) in /home/cralunip/public_html/sites/all/modules/views/modules/comment/views_handler_field_node_new_comments.inc on line 100.
strict warning: Declaration of views_handler_field_upload_description::init() should be compatible with views_handler_field::init(&$view, $options) in /home/cralunip/public_html/sites/all/modules/views/modules/upload/views_handler_field_upload_description.inc on line 72.
strict warning: Declaration of views_handler_field_user::init() should be compatible with views_handler_field::init(&$view, $options) in /home/cralunip/public_html/sites/all/modules/views/modules/user/views_handler_field_user.inc on line 47.
strict warning: Declaration of views_plugin_style_default::options() should be compatible with views_object::options() in /home/cralunip/public_html/sites/all/modules/views/plugins/views_plugin_style_default.inc on line 24.
strict warning: Declaration of views_plugin_row::options_validate() should be compatible with views_plugin::options_validate(&$form, &$form_state) in /home/cralunip/public_html/sites/all/modules/views/plugins/views_plugin_row.inc on line 134.
strict warning: Declaration of views_plugin_row::options_submit() should be compatible with views_plugin::options_submit(&$form, &$form_state) in /home/cralunip/public_html/sites/all/modules/views/plugins/views_plugin_row.inc on line 134. Prima gara di calendario - Mezza e 10 km.